Thus far Thailand’s stock market has been relatively resilient amid bouts of global market volatility following the United Kingdom’s recent decision to leave the European Union (EU). We believe the economic impact of the so-called Brexit is likely to be relatively light for countries in Southeast Asia in general. While the British people’s decision to leave the EU has sparked fears of a rise in discontent with government and policy in other countries, including Thailand, discontent can be constructive if it results in positive economic and social reforms. It’s our view that Thailand’s long-term economic and investment potential remains bright for many reasons, and once the shock of Brexit starts to wear off, investors should recognize the unique differences among individual emerging markets. I recently had the opportunity to visit Thailand. Here, I share my on-the-ground perspective on the country. I am used to frequent traffic jams in major Asian cities, but in Thailand’s largest city, the “rush hour” seems to be a 24-hour affair. 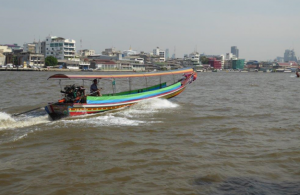 I arrived in Bangkok late at night on the weekend and was immediately confronted with crowded and congested roads. After a rest, I decided to spin my own wheels via a more serene bicycle tour through parts of Bangkok and other nearby towns and cities. I’ve found cycling to be an ideal way to see and experience a country; it’s slower than a motorcycle or car and just the right pace to see what’s happening and talk to people along the route. I had once lived in Bangkok, so I had a good idea of the city’s layout, but this latest trip gave me an opportunity to see how the area had changed. 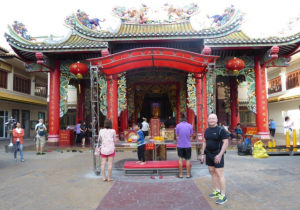 My fitness-minded colleagues and I decided to start our journey in Bangkok’s Chinatown (also known as “Yaowarat”), which has encompassed the heart of the city’s entrepreneurial spirit. Bangkok’s Chinatown dates back to 1782, when Chinese came to settle in Thailand during the reign of King Rama I. As Bangkok became a major trading center, its Chinatown continued to thrive. On my recent visit, the area was packed with street vendors and shops offering everything under the sun, including clothing, jewelry, fruits, meat, vegetables, toys— you name it and they have it! For 50 baht (US$1.50), I purchased a silver ring in the shape of Hanuman, the mythic monkey god in the Hindu Ramayana epic. 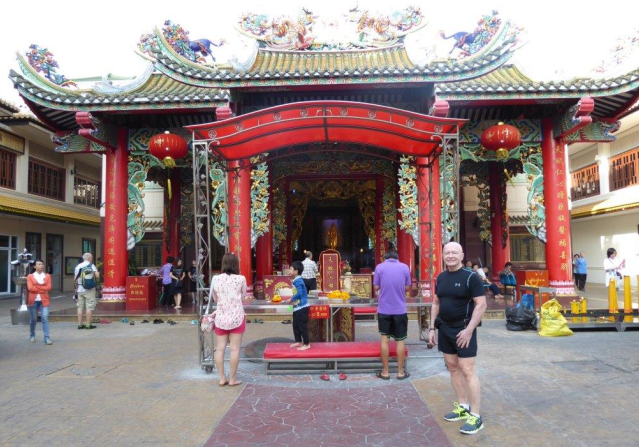 Since Thailand’s population is overwhelmingly Buddhist, I didn’t expect to see Hindu gods, but the idea of respect for all religions comes to the fore as we also cycled past a Muslim mosque and a Christian church. In the various temples and monuments dedicated to Buddha, there were stuccoes of Chinese warrior gods protecting the gates in addition to statues of soldiers with Portuguese and British faces and uniforms, as well as motifs with French influence (the Fleur de Lis) and Indian influences. Having been a trading port for centuries, Thai society has been influenced by cultures far and wide. Respect is reflected in this and many other ways—respect for Buddha, respect for the king and respect for others by showing “wai,” which involves putting both palms together in front of your face. This is the common greeting instead of shaking hands. Every time I visit Thailand, the words love, respect and freedom come to mind. It is rather paradoxical that we can describe Thailand as embodying freedom when a military government is currently in place there, while at the same time there remains so much reverence and love for the king. The name “Thailand” in the Thai language is “Muang Thai,” which means free capital or free country. Thailand is also called “Land of Smiles,” and you just need to travel around the country to understand why; everywhere you go people easily break into smiles. It is also no surprise that tourists from all over the world flock to the country because of its warm people, warm weather and many cultural attractions. Inculcated in the minds of children since early age is the idea of kindness and love. This training is beautifully expressed in the custom that many Thai males undergo—becoming a monk during some period of their life after age 20. This means shaving one’s head, donning yellow robes and going barefoot. The monks live in a temple together, sleep on thin cushions on the floor (one of the 227 rules for monks) and engage in the strictest of routines. The monks rise at sunrise, walking the street with brass bowls, accepting food from the people. The monks offer favor to the people who, through their gifts to the monks, can receive blessings. The monks then return to have their morning meal. After 12 noon, no more food is consumed, and the rest of the day is spent in meditation and chanting. Even Thai Buddhist men of the highest rank follow this custom, including the king. There are pictures of King Bhumibol Adulyadej as a monk, accepting food from common people and kneeling before the patriarch monk. These rituals and customs always impressed me. Many years ago, I got lost late at night wandering around Bangkok. When I wandered into a temple, a monk greeted me. Although his English was minimal and my Thai language skills were non-existent, he was able to communicate an invitation for me to stay the night in the temple. He escorted me to a clean wooden floor with a bamboo mat, where I had a very peaceful sleep in the serene atmosphere of the temple grounds. 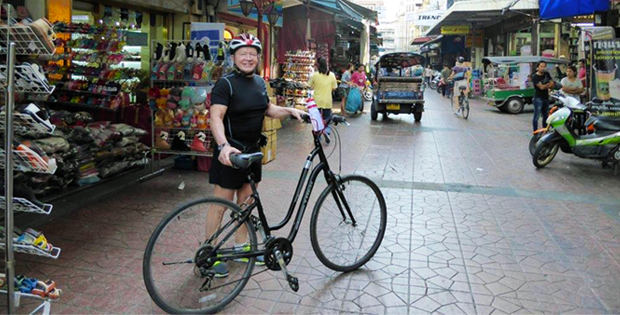 Cycling around Bangkok brought back many fond memories of my time living there in the 1960s. I remember my stay in a wooden house on Soi Sawadee (Road Hello) with no need for air conditioning despite the tropical climate; the dark teakwood floor and walls had spaces between the boards to allow a breeze to come through, which would be carried up through the tall ceilings. I was quite content to lay in bed and watch the little gecko lizards walking upside down on the ceiling. They kept the place free of flies, their main diet. As we traveled past a quiet park, we found a museum dedicated to King Bhumibol Adulyadej’s mother, Princess Srinagarindra née Sangwan Talapat, who died in 1995. The daughter of a goldsmith, she was not of royal blood. She had traveled from Thailand to the city of Boston in the United States to study nursing, where she met her future husband, Prince Mahidol Adulyadej, who studied public health and medicine at Harvard University. As an aside, there is a “King’s Square” in Boston since one of their sons (Thailand’s current king), was born there. The museum had a number of very interesting exhibitions of the princess’ life and work in the community. It also showed rare pictures of the royal family at various stages of their life and a number of artifacts which showed that she was a very active woman—the displays included skis, badminton racquets and porcelain figures that she delicately painted herself, as well as scenes of her helping the poor. One of the staff members at the museum gave me a book, Her Royal Highness the Princess Mother, which described her early upbringing at a time when King Rama V (1868 to 1910) had led Thai society into the modern age through his widespread reforms. To understand the political and economic structure of Thailand, it is important to understand the trinity of the king and royal family, the Buddhist clergy and the military/bureaucracy. Each of these institutions plays a very important role in determining the destiny of the country. The king and his family exemplify the nation’s noble spirit, the Buddhist clergy exemplify education, humility and wisdom, and the military and government bureaucracy represent stability and order. These three institutions are inexorably tied together and any important decisions must include them. Of course, Thailand has adopted a formal parliamentary democracy with representatives elected by the people as well as a judiciary. But any decisions by those groups are linked to the three most important institutions. Respect for the king and obedience to religious morals is taught in the schools, which are often adjuncts of temples and influenced by the clergy although officially run by the government. The close relationship between Europe and Thailand is exemplified in the history of a German pharmaceutical company founded in 1878 by an Austrian merchant and a German pharmacist. They started a pharmacy serving the Thai royal household, receiving many royal honors as a result. Eventually they expanded the business to become distributors for a number of European firms—some of which still exist today. During World Wars I and II, the company’s assets were expropriated (along with those of other German companies in Thailand) but each time, they returned to Thailand and resuscitated the business, expanding from pharmaceuticals into electricity generation, real estate and shipping. The company has been active in supporting a number of social projects, including reforestation projects sponsored by the king’s daughter. It offers an example of how some foreign companies have become quite integrated into Thai society. The role of the king in Thailand is much stronger than that of royalty in other parts of the world. For example, if you attend a cinema (movie theater) in Thailand, at the start of each film everyone is asked to stand while a picture and video of the king and his family is played. Also, it’s not unusual to see government officials visiting the king not merely kneeling, but showing their respect by actually stretching out on the floor in a prone position. In the eyes of many, the king has earned that respect through social causes and projects that he and his family champion, including the promotion of advanced agricultural practices in the countryside. 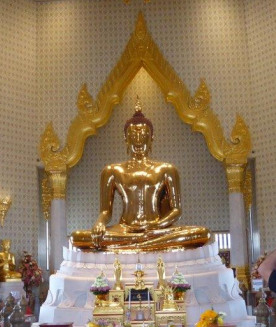 During our cycling tour, we saw one of the most amazing sites in Bangkok at the temple of the golden Buddha, which boasts a 900-year-old gold statue created during the Sukhothai period of Thai history. Legend has it that in order to hide the fact that the Buddha was made of solid gold from the invading Burmese, the Thais covered the entire Buddha in white plaster. Many generations later in 1955 when the statue was being moved, some of the plaster broke off, revealing the gold and creating quite a sensation. The statue is regarded as the largest golden Buddha in the world, measuring nearly 10 feet in diameter and just a couple inches shy of 13 feet tall. The entire statue weighs 5.5 tons. Can you calculate its worth in current prices? It must be quite a fortune! Interestingly, the monk who presides over the temple where the golden Buddha is located recently traveled to the United Kingdom to bless the Leicester City Football Club, which is owned by a Thai businessman. Many Thais believe that’s why the team won the English Premier League title! Thailand is part of the Association of Southeast Asian Nations (ASEAN) and as such, we believe it to be well-positioned to potentially benefit not only from its underlying growth trends, but also from the fast growth seen in neighboring economies of Cambodia, Laos, Myanmar and Vietnam. 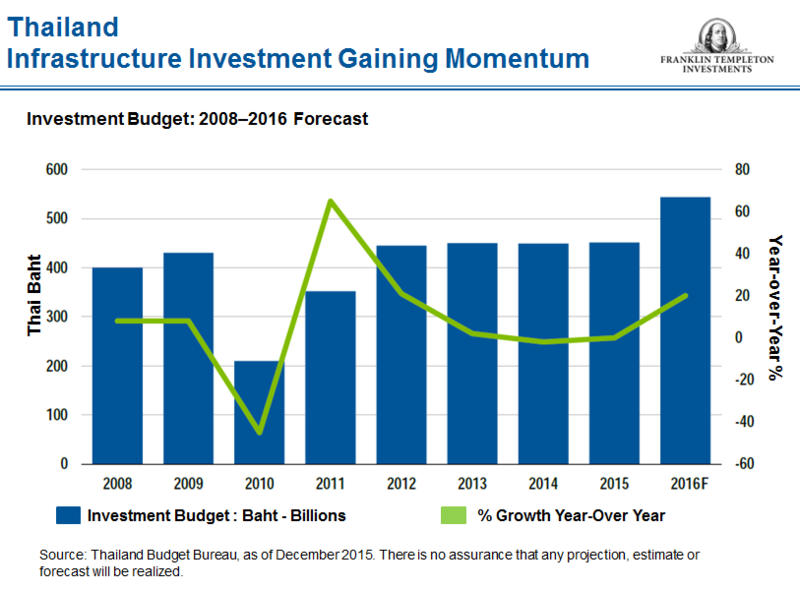 Thailand’s government has been pursuing pro-growth agendas, and seems committed to extensive market-friendly reforms and infrastructure investment, which we believe should be an important driver of economic performance going forward. Additionally, officials in Thailand have commented that while the impact of Brexit may shave 0.1% off 2016 gross domestic product (GDP) growth projections of 3%,1 trade talks with the EU won’t likely be affected, and the country could potentially implement new trade deals with the United Kingdom as an individual nation more quickly than in the past. Like other countries in the region, any further economic slowdown in China is definitely a risk for Thailand, especially for the export-oriented and agricultural sectors. The people in Thailand also worry about the military government as they see delays in the implementation of infrastructure projects that the prior government had committed to. Although there appears to have been a general flight out of so-called “risk assets” in late June, which has impacted emerging markets in general without regard to individual country—or company—fundamentals, the Thai equity market has been rather resilient. Thailand’s GDP growth has been stable, with a rise in tourism and domestic demand helping to offset the impact from a contraction in merchandise exports this year. We remain optimistic on the market’s longer-term prospects and are not overly concerned about recent Brexit-tied noise. 1. Source: GDP 2016 forecast: Bank of Thailand, as of June 2016. There is no assurance that any projection, forecast or estimate will be realized.